The default settings on my Sony Vaio CW Series laptop had wrong Gamma settings, therefore the color reproduction on the screen was slightly on the redish side. The setting on the Display on Control Panel was not getting saved due to some reason (Windows 7). 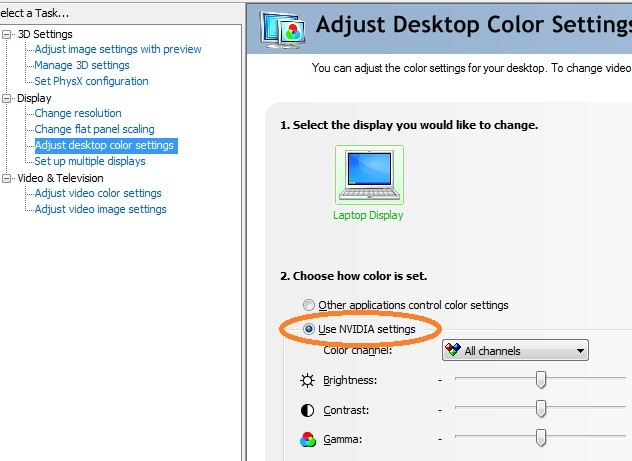 This issue can be resolved by changing the Gamma setting on the Nvidia Control Panel as shown highlighted in the image below. The Control Panel can be accessed from the desktop by Right-Click on the desktop. The radio button should be moved to the "Use Nvidia Settings".